If we don’t have lamb at least every ten days or so during the spring my family starts to worry that there’s something wrong with me. This year they were worry-free because we’ve already had our fair share of lamb and we’re only a few weeks into spring (although to be fair it feels like summer has muscled rudely shoved spring aside to settle in early here in Texas this year.) Seeing as I’m always on the hunt for new ways to cook lamb, I’m a little more excited than usual when the spring cooking magazines find their way into my mailbox and onto the bookstore shelves. 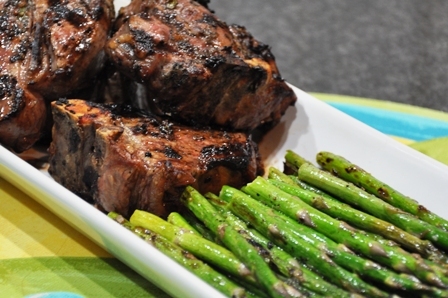 Lamb recipes abound and many of them are grill-friendly which is a bonus as I look to keep the cooking heat outside where it can mingle with the summer heat. The lamb chops marinade over night so you can do the bulk of the prep work the day before you plan to serve this dish. The meat cooks quickly so you don’t have to slave over a stove or grill for long. You can enjoy a glass of your favorite beverage while you flip the lamb a couple of times and call the dish done. The marinade uses fresh herbs that just scream spring and keeps the fat to a minimum so it’s a light and healthy option as we look to lighter fare for our menus. I served this dish with some grilled asparagus and a light pasta salad for an elegant al fresco dinner that took about 90 minutes of prep and cook time from start to fish, most of which happened the day before. I used lamb t-bone steaks instead of rib chops simply because my butcher was out of lamb racks. I planned 2-3 chops per person, or 10-12 chops for a dinner for four. The lamb t-bones take about 5 or 6 minutes to cook to medium rare so plan about 15 minutes total to grill the chops and allow them to rest. We don’t eat much garlic in our household (sadly) so I doubled the shallots and omitted the garlic. I substituted honey for sugar for no good reason – I just felt like it. I used an orange blossom honey that I thought added some complexity to the marinade so I was happy with the addition. If you can’t get the chops into a marinade the night before you can still get most of the benefit of the marinade if you start them in the morning you plan to serve them. I think this marinade would be excellent on chunks of lamb London broil threaded onto skewers for kebabs. Thread some red onions between the lamb chunks and serve with warm pitas for a more casual dinner.